(3) The son of Vyâsa said: 'At the Râjasûya sacrifice of the great soul who is your grandfather, the family members who were bound in divine love, were engaged in humbly serving his cause. (4-7) Bhîma was in charge of the kitchen, Duryodhana supervised the finances, Sahadeva managed the reception and Nakula procured the required items. Arjuna served the preceptors, Krishna washed the feet, the daughter of Drupada served the food and the magnanimous Karna handed out the gifts. Yuyudhâna, Vikarna, Hârdikya, Vidura and others like the sons of Bâhlîka headed by Bhûris'ravâ and Santardana, were, eager to please the king, willing to engage in the different duties during the elaborate sacrifice, oh best of the kings. (8) After the king of Cedi had entered the feet of the master of the Sâtvatas, the priests, the prominent officials, the highly learned and all the best well-wishers, being well honored with pleasing words, auspicious offerings and gifts of gratitude, executed the avabhritha bathing ceremony in the heavenly river. (9) During the avabhritha celebration the music sounded of a variety of gomukha horns, kettledrums, large drums, mridangas, smaller drums and conch shells. (10) Female dancers danced and singers sang joyfully in groups as the loud sound of their vînâs, flutes and hand cymbals reached the heavens. (11) The kings wearing necklaces of gold took off together with foot soldiers, nice flags and banners of different colors and well ornamented majestic elephants, chariots and horses. (12) The Yadus, Sriñjayas, Kâmbojas, Kurus, Kekayas and Kos'alas with their armies headed by [the king,] the performer of the sacrifice, made the earth tremble. (13) The officials, the priests and the brahmins of excellence loudly vibrated Vedic mantras, while the demigods and sages, the forefathers and singers of heaven sang praises and rained down flowers. (14) Men and women nicely adorned with sandalwood paste, garlands, jewelry and clothes, smeared and sprinkled each other playing with various liquids. (15) The courtesans were by the men playfully smeared with oil, yogurt and perfumed water with plenty of turmeric and vermilion powder, and they smeared them in return [*]. (16) The queens guarded by soldiers went out to witness this firsthand, just as did the wives of the gods in their celestial chariots in the sky. By their cousins and friends being sprinkled in their turn, they offered a beautiful sight with their blossoming faces and shy smiles. (17) Squirting their brothers-in-law, their friends and so on with syringes, in their excitement, their arms, breasts, thighs and waists became visible because their dresses got drenched and loosened and the braids of small flowers in their hair slipped. With their charming play they thus agitated the ones who are impure of mind. (18) The emperor mounted his chariot harnessed with the finest horses and shone, hung with gold, with his wives in all directions like he was the king of sacrifices, the Râjasûya with all its rituals, in person. (19) After the priests had guided him through the patnî-samyâja- [**] and avabhritha ceremonies, they made him perform the âcamana of sipping water for purification and bathe in the Ganges together with Draupadî. (20) The kettledrums of the gods resounded together with those of the human beings, while the demigods, the sages, the forefathers and the humans released a downpour of flowers. (21) Following this humans of all occupational and spiritual orders bathed in that place where even the greatest sinner can instantly be freed from all contamination. (22) The king next put on a new set of silken garments and nicely ornamented honored the priests, the officials and the brahmins with jewelry and clothing. (23) The king, devoted to Nârâyana, in diverse ways went at lengths in proving his respects to the kings, his friends, well-wishers, direct family, more distant relatives as also to others. (24) All the men with their jewels and earrings, flowers and turbans, jackets and silken garments as also with the most precious pearl necklaces, shone like the demigods. The women also radiated brilliantly with the beauty of their faces adorned with pairs of earrings and locks of hair and wearing golden belts. (25-26) Oh King, the highly qualified priests, the officials, the Vedic experts, the brahmins, the kshatriyas, vais'yas, s'ûdras and the kings who had come and together with their followers, the planetary rulers, the spirits, the forefathers and demigods had been worshiped, then with his permission all returned to their abodes. (27) Like mortal men drinking amrita, they never had enough of glorifying the great celebration of the Râjasûya sacrifice performed by the wise king, the servant of the Lord. (28) In his love for his family members, friends and relatives, king Yudhishthhira then stopped them. He was in pain about being separated from Krishna. (29) My dear, in order to please him the Supreme Lord then stayed there. The Yadu heroes headed by Sâmba He sent off to Dvârakâ. (30) The king, the son of Dharma [of Yamarâja or Dharma, the lord of the duties] by Krishna being freed from his feverish condition [see also 10.63: 23] thus successfully managed to cross over the so difficult to overcome ocean of his great ambition. (31) When Duryodhana one day saw the opulence in the palace, he was troubled by the greatness of the Râjasûya and of him [Yudhishthhira] whose life and soul belonged to Acyuta. (32) All the different opulences of the kings of men, the kings of the demons and the kings of the gods could be seen there. With that wealth that was provided by the cosmic architect [Maya Dânava], the daughter of king Drupada served her husbands [the Pândavas]. The Kuru-prince lamented, for his heart was fixed on her. (33) The thousands of queens of the Lord of Mathurâ were there also present at the time, most attractive with their waists and heavy hips moving around slowly on their feet that charmingly tinkled, wearing their pearl necklaces reddened by the kunkuma from their breasts and with their beautiful faces richly adorned with earrings and locks of hair. (34-35) In the assembly hall constructed by Maya it so happened that the son of Dharma, the emperor in person, in the company of his attendants, his family and also Krishna - who was his Very Eye - was seated on a throne of gold, being endowed with the opulences of supreme rulership and praised by court poets, like he was Indra. (36) There, oh King, then entered Duryodhana surrounded by his brothers. Proud as a peacock wearing a crown and necklace, he with a sword in his hand was ranting angrily [at the doorkeepers]. (37) Bewildered by the magic of Maya taking the solid floor for water, he held the end of his garment high, but further up he fell into water that he mistook for a solid floor. (38) Bhîma seeing it laughed out loudly just as the women, the kings and the rest did, my dear. Even though they were checked by the king, it carried the approval of Krishna. (39) He [Duryodhana], burning with anger, embarrassed with his face turned down, being hurt within left for Hastinâpura whereupon from the saintly ones rose a very noisy 'Alas alas!' Ajâtas'atru [the king] felt a little sad, while the Supreme Lord, from whose glance the bewilderment had risen, kept silent. He was prepared to remove the burden from the earth [see also 1.15: 25-26, 10.2: 38 and 10.63: 27]. Third revised edition, loaded October 12, 2014. The son of Vyâsa said: 'At the Râjasûya sacrifice of the great soul who is your grandfather, the family members who were bound in divine love, were engaged in humbly serving his cause. Bhîma was in charge of the kitchen, Duryodhana supervised the finances, Sahadeva managed the reception and Nakula procured the required items. Arjuna served the preceptors, Krishna washed the feet, the daughter of Drupada served the food and the magnanimous Karna handed out the gifts. Yuyudhâna, Vikarna, Hârdikya, Vidura and others like the sons of Bâhlîka headed by Bhûris'ravâ and Santardana, were, eager to please the king, willing to engage in the different duties during the elaborate sacrifice, oh best of the kings. After the king of Cedi had entered the feet of the master of the Sâtvatas, the priests, the prominent officials, the highly learned and all the best well-wishers, being well honored with pleasing words, auspicious offerings and gifts of gratitude, executed the avabhritha bathing ceremony in the heavenly river. During the avabhritha celebration the music sounded of a variety of gomukha horns, kettledrums, large drums, mridangas, smaller drums and conch shells. Female dancers danced and singers sang joyfully in groups as the loud sound of their vînâs, flutes and hand cymbals reached the heavens. The kings wearing necklaces of gold took off together with foot soldiers, nice flags and banners of different colors and well ornamented majestic elephants, chariots and horses. The Yadus, Sriñjayas, Kâmbojas, Kurus, Kekayas and Kos'alas with their armies headed by [the king,] the performer of the sacrifice, made the earth tremble. The officials, the priests and the brahmins of excellence loudly vibrated Vedic mantras, while the demigods and sages, the forefathers and singers of heaven sang praises and rained down flowers. Men and women nicely adorned with sandalwood paste, garlands, jewelry and clothes, smeared and sprinkled each other playing with various liquids. The courtesans were by the men playfully smeared with oil, yogurt and perfumed water with plenty of turmeric and vermilion powder, and they smeared them in return [*]. The queens guarded by soldiers went out to witness this firsthand, just as did the wives of the gods in their celestial chariots in the sky. By their cousins and friends being sprinkled in their turn, they offered a beautiful sight with their blossoming faces and shy smiles. Squirting their brothers-in-law, their friends and so on with syringes, in their excitement, their arms, breasts, thighs and waists became visible because their dresses got drenched and loosened and the braids of small flowers in their hair slipped. With their charming play they thus agitated the ones who are impure of mind. The emperor mounted his chariot harnessed with the finest horses and shone, hung with gold, with his wives in all directions like he was the king of sacrifices, the Râjasûya with all its rituals, in person. After the priests had guided him through the patnî-samyâja- [**] and avabhritha ceremonies, they made him perform the âcamana of sipping water for purification and bathe in the Ganges together with Draupadî. The kettledrums of the gods resounded together with those of the human beings, while the demigods, the sages, the forefathers and the humans released a downpour of flowers. Following this humans of all occupational and spiritual orders bathed in that place where even the greatest sinner can instantly be freed from all contamination. The king next put on a new set of silken garments and nicely ornamented honored the priests, the officials and the brahmins with jewelry and clothing. The king, devoted to Nârâyana, in diverse ways went at lengths in proving his respects to the kings, his friends, well-wishers, direct family, more distant relatives as also to others. All the men with their jewels and earrings, flowers and turbans, jackets and silken garments as also with the most precious pearl necklaces, shone like the demigods. The women also radiated brilliantly with the beauty of their faces adorned with pairs of earrings and locks of hair and wearing golden belts. Oh King, the highly qualified priests, the officials, the Vedic experts, the brahmins, the kshatriyas, vais'yas, s'ûdras and the kings who had come and together with their followers, the planetary rulers, the spirits, the forefathers and demigods had been worshiped, then with his permission all returned to their abodes. Like mortal men drinking amrita, they never had enough of glorifying the great celebration of the Râjasûya sacrifice performed by the wise king, the servant of the Lord. In his love for his family members, friends and relatives, king Yudhishthhira then stopped them. He was in pain about being separated from Krishna. My dear, in order to please him the Supreme Lord then stayed there. The Yadu heroes headed by Sâmba He sent off to Dvârakâ. The king, the son of Dharma [of Yamarâja or Dharma, the lord of the duties] by Krishna being freed from his feverish condition [see also 10.63: 23] thus successfully managed to cross over the so difficult to overcome ocean of his great ambition. When Duryodhana one day saw the opulence in the palace, he was troubled by the greatness of the Râjasûya and of him [Yudhishthhira] whose life and soul belonged to Acyuta. All the different opulences of the kings of men, the kings of the demons and the kings of the gods could be seen there. With that wealth that was provided by the cosmic architect [Maya Dânava], the daughter of king Drupada served her husbands [the Pândavas]. The Kuru-prince lamented, for his heart was fixed on her. The thousands of queens of the Lord of Mathurâ were there also present at the time, most attractive with their waists and heavy hips moving around slowly on their feet that charmingly tinkled, wearing their pearl necklaces reddened by the kunkuma from their breasts and with their beautiful faces richly adorned with earrings and locks of hair. In the assembly hall constructed by Maya it so happened that the son of Dharma, the emperor in person, in the company of his attendants, his family and also Krishna - who was his Very Eye - was seated on a throne of gold, being endowed with the opulences of supreme rulership and praised by court poets, like he was Indra. There, oh King, then entered Duryodhana surrounded by his brothers. Proud as a peacock wearing a crown and necklace, he with a sword in his hand was ranting angrily [at the doorkeepers]. Bewildered by the magic of Maya taking the solid floor for water, he held the end of his garment high, but further up he fell into water that he mistook for a solid floor. Bhîma seeing it laughed out loudly just as the women, the kings and the rest did, my dear. Even though they were checked by the king, it carried the approval of Krishna. He [Duryodhana], burning with anger, embarrassed with his face turned down, being hurt within left for Hastinâpura whereupon from the saintly ones rose a very noisy 'Alas alas!' Ajâtas'atru [the king] felt a little sad, while the Supreme Lord, from whose glance the bewilderment had risen, kept silent. He was prepared to remove the burden from the earth [see also 1.15: 25-26, 10.2: 38 and 10.63: 27]. *: Present day India knows the tradition of the Holi celebrations, the festival of colors once a year on the morning after the full moon in early March every year, where one plays this game. It celebrates the arrival of spring and the death of the demoness Holika. Holika was the sister of Hiranyakas'ipu who fighting Prahlâda could not succeed in killing him [see 7.5]. She, said to be fire resistant, sitting with him in a fire could not harm him. He remained unscathed, but she burned in the fire to ashes. Thus are with Holi the night before great bonfires lit to commemorate the story. Although Holi is observed all over the north, it's celebrated with special joy and zest at Mathurâ, Vrindâvana, Nandgaon, and Barsnar (the places where Lord Krishna and S'rî Râdhâ grew up). Lord Krishna, while growing up in Vraja, popularized the festival with His ingenious pranks. The gopîs of Vraja responded with equal enthusiasm and the festivities have continued ever since. Role reversal with travesty, feminism etc. are accepted customs for the duration of the festival. Men and women of Vraja clash in a colorful display of a mock battle of the sexes. A naturally occurring orange-red dye, Kesudo, is used to drench all participants. **: The patnî-samyâja ritual is the ritual performed by the sponsor of the sacrifice and his wife, consisting of oblations to Soma, Tvashthâ, the wives of certain demigods, and Agni. 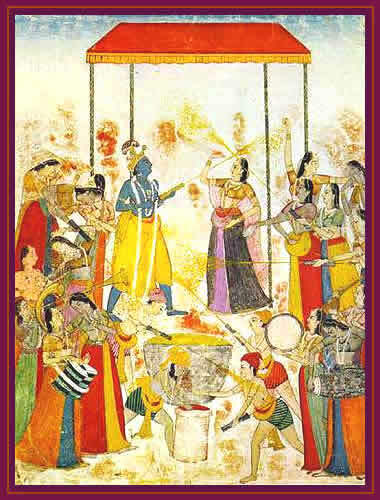 The picture shows Krishna celebrating the Holi festival. Source unknown.